Description: A yard switcher teams up with a road engine to retrieve empties at Belden Brick. Description: The NS H82 on the Bergen County Line with a B40-8 and SW1001. Description: The NS H82 makes its way through the snow to retrieve some empties after the President's Day blizzard. Description: Under the watchful eye of the conductor, the NS H82 backs into Belden Brick. 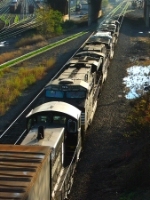 Description: 2 Norfolk Southern SW-1001's , built by EMD in 1973 and rated at 1000 HP, are still at work in 2005. Description: Two switchers come into Swedeland to work a small yard. Description: NS HM01 sits on the ladder track at Abrams Yard. Description: A lite power move heads east to Allentown. Description: A lite power move heads east to Allentown. The lead unit is a then-new GP38-3 rebuilt from a GP50. Description: NS H25 blows past NS 38G. Description: The NS H14's power for this saturday morning was a pair of back to back former Conrail B40-8's. Description: NS yard transfer job H25 zips east along the Harrisburg Line behind former Conrail SW1001 here at W. Conshohocken. Description: An ex-RDG pup helps out the big boys on the former RDG main (date approximate). Description: NS 34A is enterning Enola Yard with some ferry units for the Enola engine house. Description: NS 34A is waiting for the yard shifter to get out of the way so that they can yard their train. Description: A pair of worker SW1001s bring out the Falls-bound H3A out of Abrams yard. Description: H3A with NS 2101 and NS 2102 as the leaders passing abrams yard. Description: Westbound on track one with four GE widecabs, a high nose geep, and a switcher in the consist. Description: Some SW1001s and some GP38-2s. Description: 14G crawls through Abrams toward the yard office with black barf on the head end. Description: Unlikely suspect is in charge of NS loaded coal 502 here at CP Norris on the Harrisburg Line; Q190 in the background awaiting it's power to couple up and head east out of town. 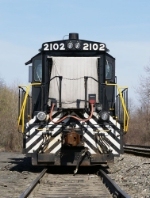 Description: A look at NS 2101.